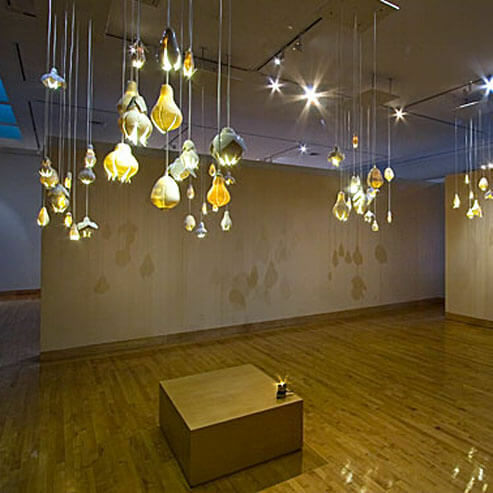 Linda Lighton’s work is in many national and international collections: Nelson Atkins Museum, Kansas City, MO; Kemper Museum of Contemporary Art, Kansas City, MO; Daum Museum, Sedalia, MO; Spencer Museum, Lawrence, KS; Icheon International Ceramic Museum, Icheon, Korea; Fule International Ceramic Museum, Fuping, China; Ariana Museum, Geneva, Switzerland; Johnson County Community College, Overland Park, KS; and University of Ohio, Athens, OH. I am interested in the life force, a dangerous beauty that entails seduction, sexual prowess, moaning hormones. I want to celebrate the spirit of life, edging toward figuration, beckoning seductively, shouting, singing opera for recognition, beckoning the viewer to come closer, come hither. I want to make something gorgeous and elegant. Oops, have I gone over the line? Are these Baroque-a-go-go? I would like my work to smell of the saltiness of the sea, have colors as soft and slippery as a satin quilt. Taste the effervescent tingle of pink.